Genevieve M. Huebner, age 96, of Sylvania, Ohio passed away peacefully Saturday October 13, 2018, at Kingston Residence of Sylvania surrounded by her family. She was born February 18, 1922, in Sylvania, Ohio to Harry and Pearl Cooper. She graduated from Burnham High School in 1940. Genevieve married John Huebner, July 25, 1945. She was preceded in death by her husband, John of 47 years and their son James. She worked for Lamsons, Spicer and 18 years with Sylvania Schools in the cafeteria at Sylvan Elementary School. 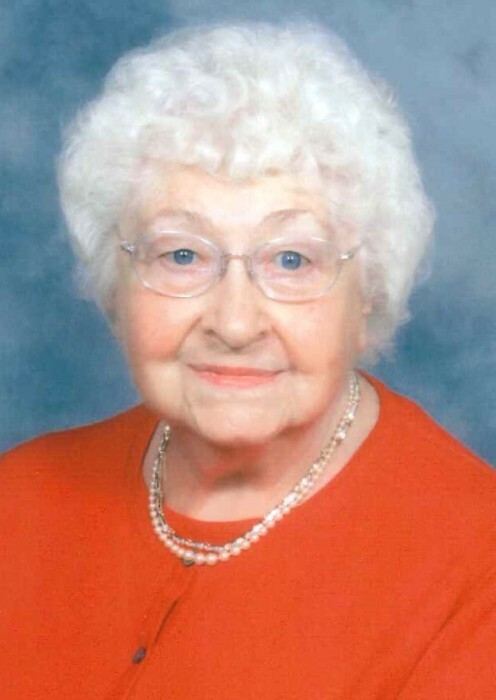 She was a longtime member of First Christian Church, Sylvania and a member of the American Legion Auxiliary Joseph W. Diehn Post 468, since 1941. She enjoyed spending summers at her cottage at Vineyard Lake, Brooklyn, Michigan. Her joy was taking thousands of pictures of her family and friends and showing them to all visitors. She loved to care for her flowers and make dresses. She cherished her knickknacks sprinkled in among family pictures. Genevieve is survived by her sons, Gary (Donna), Dennis (Carol), Robert (Laurie) and daughter-in-law Dawn, grandchildren Julie Huebner, Dana (Peter) Krall, Kevin (Jenny) Huebner, Gregory (Shanna) Huebner, Eli Huebner, Alyssa Huebner and Alexandra Huebner, great-grandchildren Lauren, Daniel, Matthew, Brendon and Macie.